Socrates, 470-399BC Greek Philosopher said, "Man know thyself". And according to Obafemi Awolowo, "A people, ignorant of their history are the easiest prey to political enslavement and economic exploitation" it is on this premise that I sometimes, wonder what would have been the fate of this my generation, and future generation of Biafrans in Nigeria, if not for Nnamdi Kanu, the leader of Indigenous People of Biafra (IPOB), and Radio Biafra that helped to teach the Biafran masses who they really are, we would have ignorantly forgotten our history and remained political slaves forever! No wonder some powerful forces from the North and West, began to clamp down on the study of history immediately after the war, in accordance with their first curriculum conference in Lagos, which first expunged history from primary and junior secondary schools and later, in subsequent curriculum conferences. The clamp down continued to senior secondary schools and the Universities. That today no few Universities can dedicate department of history unless its amalgamated with other department. According to prof. Michael Omolewa, in his speech during the 2014 conference of History of education society of Nigeria, published in the Guardian Newspaper of 10th February 2015, he said: "there is also the need to check the input of some powerful forces that were able to influence curriculum's development either directly or by proxy. Historical scholarships will benefit from a further exploration of the impact that has been made by the seemingly faceless lobbyist and bureaucrats, who may have been uncomfortable about the trend of knowledge availability about the course of the history of Nigeria and resolved to put an end to the teaching of history"
From the humble submission of this erudite Emeritus Prof. and former Dean faculty of Education at the University of Ibadan, it is obvious that the so called powerful, faceless lobbyist and Bureaucrats that undermined our education system is seriously hiding something from us, which they desperately hope and pray that we never find out, because knowledge is power! And according to Tom Clancy, if you can control the information, you can control the people! Therefore, the Northern Oligarchy with their Yoruba allies, consciously and deliberately denied the Nigerian scholars and successive generation youths, the true knowledge of the Nigerian History, in other to be in total control of the masses! However, this Education Policy, was directly targeted at the Biafran people from the old Eastern Nigeria that managed to survive a brutal war of genocide, thus the "genocidists", sought to make sure that the word Biafra is never mentioned again in schools, talk more of teaching "Her people", "Her History" and "Her war" of genocide and ethnic cleansing, in other to cover up their atrocities against Biafran people. Because some people think that the truth can be hidden with a little cover up and decorations, but its always the cover up that causes trouble and not the event. Nevertheless, they successfully implemented this cover up of sinking the word Biafra into oblivion, through the military laws of the successive Nigerian Military juntas, that prohibited freedom of the press, freedom of speech and freedom of information. However, I thank God for the return of democracy and the gift of Nnamdi Kanu and Radio Biafra plus the advent of social media and Jonathan's freedom of information bill (FOI). Perhaps, the powerful knowledge brokers at the top, can no longer dictate the "dosage" or the amount of information that we can get in this information age! No wonder they are greatly startled by the resurgence of "Biafranism" despite their imaginary "Burial of Biafra" through their education policy, and have resorted to unprovoked verbal outbursts of their inner frustration and anger at their failure to annihilate Biafra despite all they have done to make Us forget Biafra, just like Buhari told our youth corpers that went to pay him courtesy visit on salah day in his country home Duara on Monday, 12th September 2016. Having conquered our fathers and grand fathers, and made them cowards by breaking their fighting spirit with the horrors of Genocide and ethnic cleansing, they thought that we their children, their grandchildren and our future generations, will remain in perpetual political slavery and economic exploitation like our fathers and grandfathers who are the present so called political leaders and educated elites through their skewed education system. No wonder most of our so called educated elites that passed through this censored education system and streamlined knowledge are still easy preys in the hands of the Nigerian Northern Oligarchy and their Yoruba Allies. It is said that the foundation of every nation is in the education of its youths, thus the Nigerian government intentionally and consciously undermined our Biafran National identity, immediately after the war, through our education system, by cleverly keeping successive generations of Biafran Scholars (the supposed future leaders) ignorant of their history! This is especially true among our science secondary students and scholars in the university who are not exposed, to any form of knowledge of history in accordance with the Nigerian education curriculum. Unlike the American and other European curricula where every student no matter your field of studies is made to study history and for them to have a sense of patriotism. In Nigeria, only the art students are exposed to some elements of twisted history in form of government which they have now replaced with civic education with a carefully planned syllabus that expunged every element of "Biafranism" except off course the Nigerian government official account of the civil war of genocide, which is an integral part of the Nigerian Checkered "National History". However, genocide before, and during the war remained untold like the Asaba Massacre. 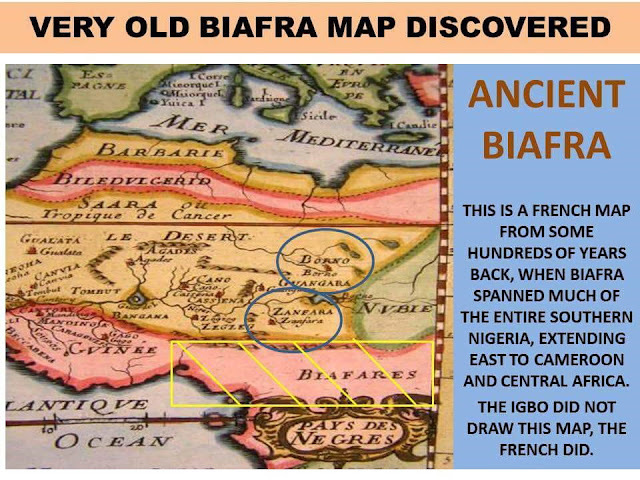 The change of Bight of Biafra in the map of Africa to Bight of Benin after the war. The History of Methodist church of Biafra before Nigeria's Amalgamation. The palm oil war and the British conquest of Biafra using Religion. The founding of Igweocha city renamed Port Harcourt by the colonial masters. 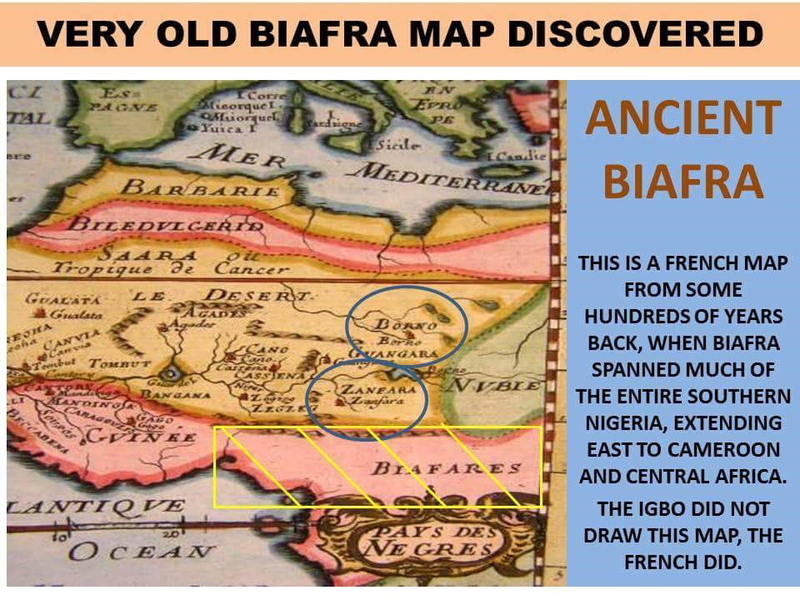 The Biafran society and their free trade, before the white man came. The cultural sameness of the Biafran people in contrast to Arewa North and Oduduwa west. The Biafran self government during the war that lasted for almost three years. Her diplomatic relationship with other countries, her innovations and her key Government officials. The Nigerian Twenty pounds economic policy against Biafrans immediately after the war. These and many more are some of our remarkable histories that defines who we are which you will never learn in school and according to Marcus Garvey a people without the knowledge of her history is like a tree without root. Other interesting international histories that makes us true and knowledgeable members of international society, are gradually being removed from our schools syllabuses like the Islamic Jihads and the total collapse of Christianity in the Middle East. The European conquest of Africa and after the Berlin conference of 1885. The American independence war against Britain known as the American Revolution, led by George Washington. The Rise and fall of seven Empires that ruled the world. We live in a world where events has a way of repeating itself as nothing is new under the sun. Ecclesiastics 1:9 and without the knowledge of history, we are doomed to repeat it - Winston Churchill. History is a very important rudimentary knowledge our today's scholars and professionals lack because it is no longer taught in schools. Time has gone when an educated person knows something about everything, because our education system has become so streamlined in other to achieve some certain purpose. Yet everyday you see these products of censored education system and streamlined knowledge come on National Television, and social media and even newspapers to expose their ignorance about the Biafran people and her territories, without any sense of History. However, three things they say cannot be long hidden, the sun, the moon and the truth. therefore no matter how long the Nigerian government tries to confuse and hide the truth from the masses, by expunging History from our schools curriculum, the truth must surely prevail.